Summary: A game where you try to knock over the three-legged stool. Place the stool in the middle of your yard or field. One player, called the stoolie, is given the stick and must defend the stool. The others stand behind a line about 10 to 15 feet away. Each player takes a turn at trying to knock over the stool by throwing the ball at it. The stoolie uses the stick to bat the ball away. The one who knocks over the stool wins and becomes the new stoolie. 1) At THANKSGIVING and HALLOWEEN, use a pumpkin instead of a soccer ball. 2) Instead of the stoolie using a stick, let them use any part of their body except their hands. 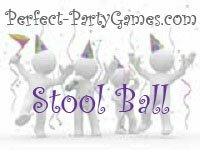 3) Maybe use two balls with the players standing in a circle around the stool and let the stoolie try to guard against both balls at once.